To ensure the safety of all of our guest, NO ONE is allowed to bring their own paintballs to play at Planet Paintball. If you violate this rule you will be escorted off property by law enforcement. We only sell paintballs that have been properly stored in a climate controlled enviroment so that they are safe for play. 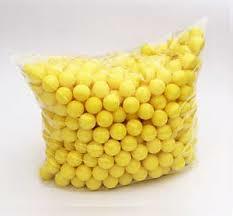 We can not verify the safety of any other paintballs. 500 Paintballs Orange Shell-Fill, White Shell-Fill, Yellow Shell-Fill These paintballs have a thinner shell which makes them break on target more often. This paint was designed and priced to be straight-shooting and affordable; it's the best paintball you can get for the price!